Long story short…one of my roommates gave up dairy for Lent. She was making rice milk, which in turn made me want horchata, a milky, sweet rice drink from Mexico. The first time I had it was at one of my favorite restaurants in Chicago. It may be my favorite for nostalgic reasons only, but their burritos are delicous and so I doubt it is only fond memories. 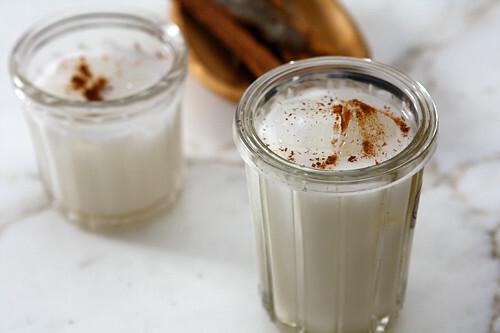 Anywhoo…I looked and found this recipe for horchata on Pinterest. The recipe is really simple and I’m already on my second batch. Grind up the dry rice into fine pieces, or as fine as your grinder will go. I use a cleaned out coffee grinder. Put it into a jar and then pour the warm water over the top. Pop in the cinnamon stick and then put the whole concoction in the fridge for at least 8 hours or overnight. I make the first step and then leave it in the fridge for a day or two until I have time to finish. After the rice, water, and cinnamon stick jar has sat for the proper amount of time; take out the cinnamon stick and puree the rice and water until the rice is as fine as possible. The first time I made this recipe, I forgot to take out the cinnamon stick and it got pulverized, but it was fine because…next, you need to strain the mixture through a couple layers of cheesecloth. The easiest way I found is clothes-pinning the cheesecloth to a strainer. The straining will be slow going because the rice is so fine it is like a flour or fine sand. Once it gets down to an amount I can manage, I unpin the material and squeeze out the rest of the liquid. *Side note: be careful what you rinse down the sink. I’m not expert, but the consistency of the rice after it has been strained out seems like just the stuff to clog drains. Alright…last step. Just mix in the milk and sugar and stir until it is dissolved. Then serve your yummy finished product over lots of ice and you are ready to go!! After doing a little research it seems that some people also put almonds in overnight. Also, some people skip the milk. I don’t know which is the most authentic way, but this recipe works for me! By the way, I just used generic long grain rice, but you can use different kinds of rice and they make the horchata taste different. Check out this post about the authors experiment with different rices. I haven’t had the ingredients for smoothies lately, so I have been throwing a bunch of ice and some horchata in my cup in the morning. It has less sugar then my coffee would and it is making my bones strong. Win, win and oh, so nummy. Previous: Previous post: Anti-hipster…Not Anti Hipsters. Next: Next post: Pride and Prejudice and…Zombies?